Reality had to hit at some point. 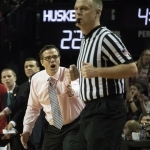 After stringing together an improbable mini run in the Big 10 Tournament to qualify for postseason play using just seven players, the Huskers crashed out of the NIT and saw their season come to a close in a loss to TCU in the second round of the NIT Sunday night, finishing 19-17 overall. In a season marred by career ending injuries, the failure to make the NCAA Tournament after returning four starters from a team that won 22 games and finished fourth in the Big 10, will likely lead to the departure of seventh year head coach Tim Miles. His team played hard against the Horned Frogs. However, NU ultimately was unable to recover from a woeful first half and could not out maneuver a TCU team that possessed superior size and athleticism. James Palmer Jr. shot an abysmal 0-10 from the floor in the first half. It was still very much a game at halftime, however. The Horned Frogs weren’t able to create much separation on the scoreboard. They were just 4-16 from beyond the arc, allowing NU to stay in it. By the time the halftime buzzer sounded it was only an 8 point game. To start the second half, Palmer made things interesting going 3-3 from downtown. He was fantastic in the second, scoring 19 points, enough to surpass Husker legend Dave Hoppen’s single season scoring record of 704 points that he set in 1985. None of it was enough though, as TCU hammered the Huskers 88-72 in Fort Worth. The Horned Frogs will take on Creighton in Omaha Tuesday night. Molinari also said that the group takes on the “personality of the leader,” and that the fight the team has shown over the past two weeks comes down to Miles’ leadership. It was a heartfelt show of support from a coach on a staff that has likely coached their last game at NU, a program that will look very different in the coming days. Four seniors will be moving on – Tanner Borchardt, Johnny Trueblood, Glynn Watson Jr., and Palmer. Roby, a junior, could leave as well. What occurs over the next few days could permanently reshape the Nebraska basketball program for years to come.